Naturally cleansing; contains NO alcohol and NO bleach. Outer plastic bag is 100% recyclable. Gently cleans your mat but will maintain the important sticky, no-slip surface. Dries quickly and evaporates completely on your yoga mat so you can wipe it down and step right on it to begin your yoga practice. Can be used to clean your mat, yoga props, and fitness equipment, or to cleanse your feet and hands before you practice. Essential Oil Wipes Made in the USA. Clean your mat...Calm your mind! Jo-Sha Wipes are natural, cleansing, yoga mat wipes infused with soothing essential oils. You will appreciate having a clean yoga mat on which to practice while you enjoy the healing benefits of essential aromatherapy oils like Lavender, Peppermint, Eucalyptus, Tangerine and Tea Tree. Jo-Sha Wipes dry quickly and evaporate completely, leaving the yoga mat with its important sticky surface and a faint lingering scent that invigorates the senses and adds to your yoga practice. Each wipe is infused with one of four essential oils to provide that soothing scent during and after cleaning. Use Eucalyptus to promote mental clarity and to cleanse negative energies caused by physical or emotional distress. Use Lavender to restore balance and evoke a sense of calm and relaxation. Use Peppermint to invigorate the mind and to awaken dull senses. Use Tangerine to create an uplifting inner atmosphere of joy and to ease mental burdens. The wipes come in convenient packets so you can easily throw a few Jo-Sha Wipes in your yoga mat bag and be on your way. Not only will you have a clean mat, but you will get the benefits of healing aromatherapy. Naturally cleansing; contains NO alcohol and NO bleach. Outer plastic bag is 100% recyclable. Available in: Lavender, Peppermint, Eucalyptus, Tangerine, or an assortment of all 4 scents. 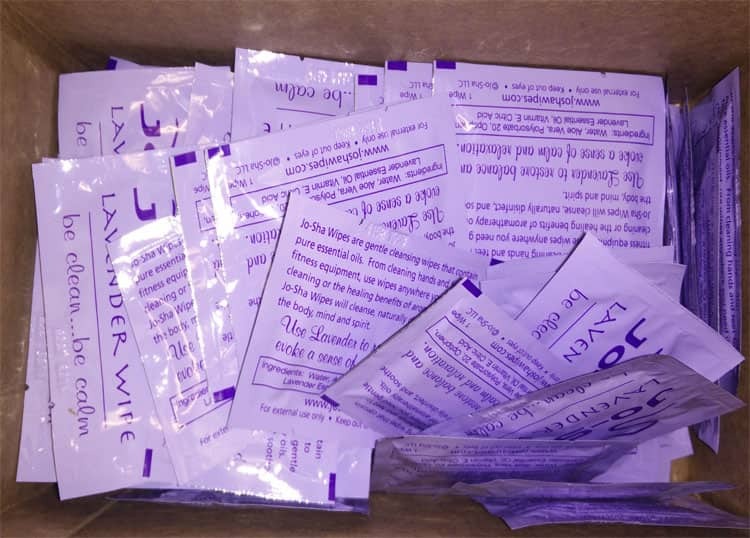 Wipes are individually packaged (for single use). Ingredients: Water, Aloe Vera, Polysorbate 20, Optiphen, Essential Oil (Lavender, Peppermint, Eucalyptus or Tangerine), Vitamin E, Citric Acid. Aloe Verais a very common natural extract from the plant. It is widely used in cosmetic and pharmaceutical preparations for its soothing and healing properties. Polysorbate 20is a natural emulsifier that bonds the water and the essential oils. Optiphen is a natural and safe preservative accepted globally. It is a unique formulation which consists of phenoxyethanol and an emollient base. Vitamin E is a fat-soluble vitamin that is an important antioxidant. Vitamin E is often used in skin care products because it is believed to play a role in encouraging skin healing and reducing scarring after injuries. Citric Acidcomes from citrus fruits. It is a natural preservative and is also used as a cleaning agent and antioxidant.